Review by Olorin on 6/1/2012. The layout is interesting with several large land areas being contact for many small territories. The language bonuses are difficult to obtain due to disperion away from core areas and only tend to add to the eventual winners advantage toward the end. I am sure some of the regional native tribe locations exact placement could be debated somewhat however it does give an interesting look at US North America without western influence. Review by QuickDraw on 7/25/2012. Great variant on the other USA maps, fun to play. Review by Akhoya on 10/23/2012. Has good variety and only a few connection problems. Great map! Review by MWDanske on 6/14/2014. Review by indiman112 on 1/6/2015. Best with 3 players for me. Review by barakobama on 3/18/2015. 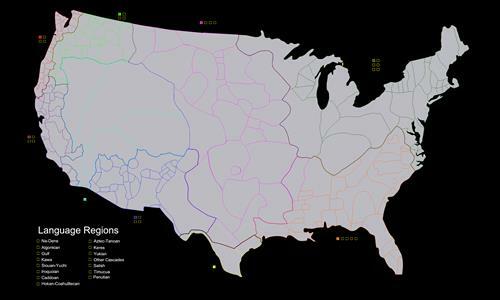 There are far more territories on the west coast than the eastern half of the USA. Bonus points accumulate quickly in the relatively sparse eastern half. To balance the map I would award points more on the basis of number of territories controlled. Review by Josh on 7/10/2016. Review by Purple on 5/18/2013.